The word freedom appears three times in the 1916 Proclamation. The freedom then asserted wasn't just political freedom - the rebels also had in mind economic freedom: 'the unfettered control of Irish destinies'. Sadly, as we approach this year the 95th anniversary of the Rising, the indicators are that our freedom - economic and political - are in retreat. 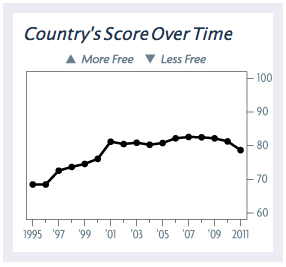 Take the recently published 2011 Index of Economic Freedom. It didn't rate a single mention in the Irish mainstream media as far as I can tell. Which is a pity since the report contains a warning: our economic freedom, while still high relative to most other countries in the world, has deteriorated recently due to the Government's handling of the banking crisis. Not only has there been a structural increase in the size of the public sector thanks to the socialisation of private sector losses, but so also has there been an increase in the power of the State due to the legislation arising from the crisis. 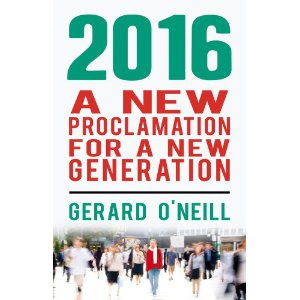 The Credit Institutions Stabilisation Bill 2010 establishes the State not only as the biggest property developer (via NAMA), it also equips the Minister for Finance with special powers to imprison bank employees should they ever publicise the fact that the Minister has used the powers given him by the bill! We are at a dangerous point in our history. Not only have the mistakes of this government cost us our economic sovereignty, they now threaten to undermine our political freedom as well. The upcoming centenary of the Rising in 2016 should be a beacon to remind us of the hard-won freedoms we have secured, and duty of all of us to continue to defend them.